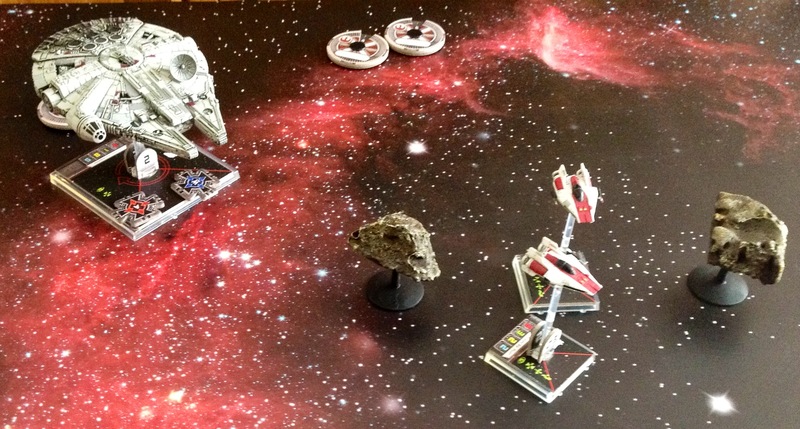 This was an odd choice to play solo given the hidden movement mechanic, but with the arrival of the new ships and the impending dual with my son over Easter, I felt I needed to brush up on the rules and some tactics. Also, being completely depressed by the rugby (the injury rate in the Irish team being comparable to the attrition my Crusaders are suffering in a Vassal game I’m playing at the moment), I needed something which wasn’t too heavy. Anyone who enjoyed “Wings of War” would enjoy this game, though the movement mechanic of playing 3 move cards has changed to selecting a move on a dial which is then placed face-down beside the ship it applies to. Each ship comes with a stat card which detail the pilot skill as well as what their attack and damage ratings are, any special actions they can perform and whether they have shields or not – much of this information is replicated on the model ship’s base, which is useful. There’s a choice of up to 6 pilots for each machine – there may be more with some of the expansions which I don’t own – and each ship can be given upgrades, though this means you will get less ships for your force. 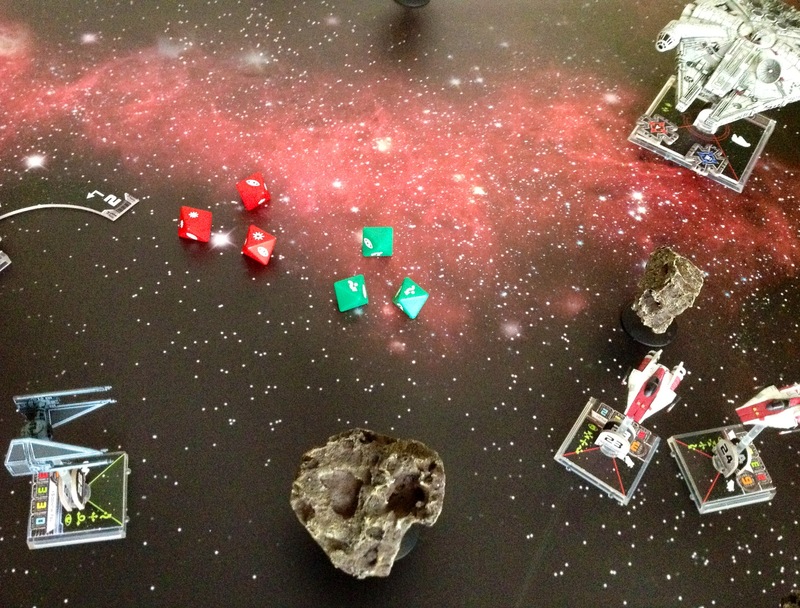 Shooting is dealt with by opposing dice rolls with certain special actions able to influence the dice in the attacker or defender’s favour, but when there are any hits left over then damage has to be taken. There are two types of hits shown on the dice – normal and critical (as in “Wings of War”), and normal hits must be cancelled before criticals. 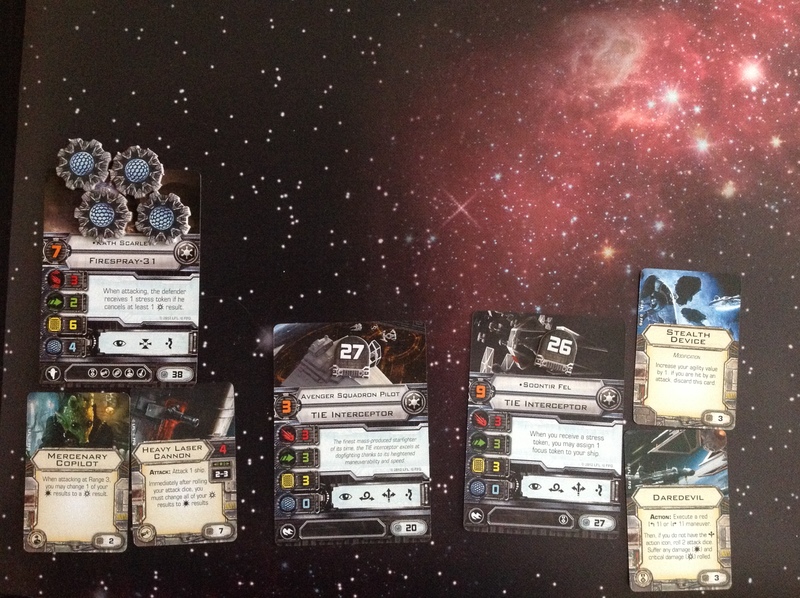 A normal hit just draws the top card off the damage deck and places it beside the ship card face down – when the number of normal hits equals or exceeds the hull value of the ship, it is destroyed. A critical hit means the damage card has to be turned over and this is always bad, ranging from damage to engines/cockpit etc (which can sometimes be repaired) to losing 2 hull points. That’s more or less all there is to it. 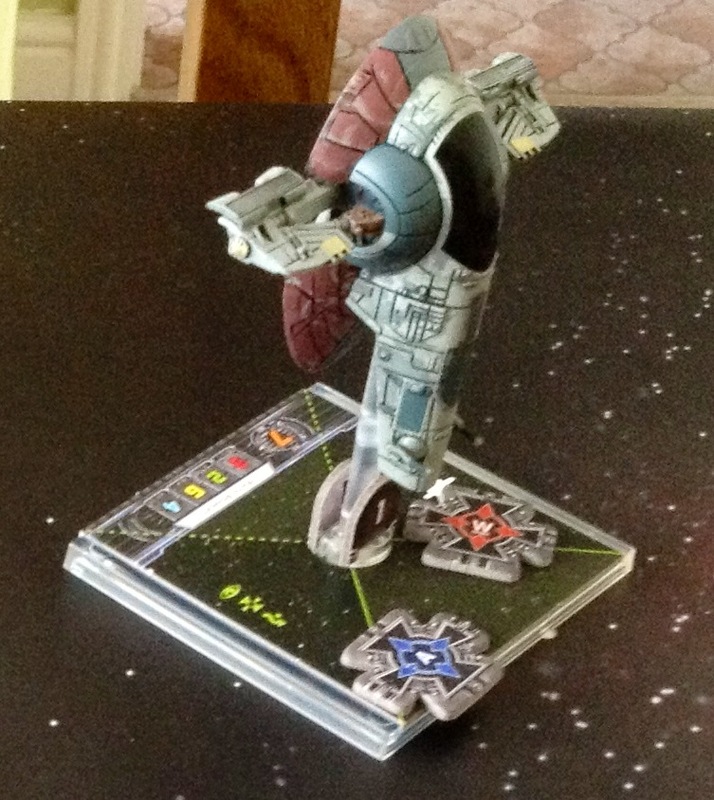 There’s a few extra bells and whistles such as stressful moves which allow difficult manoeuvres at the expense of losing special actions in future turns until you perform a calmer manoeuvre, but sometimes you have to perform that Immelman to avoid flying off the 3′ x 3′ board (thus exiting the game). There are also penalties for hitting asteroids and shooting at ships obscured by asteroids, but not too much to remember. If the above sounds too simple, it still gives a really exciting game in under an hour on a small table which is sometimes all I have time for. The one issue I would have with the game is price. 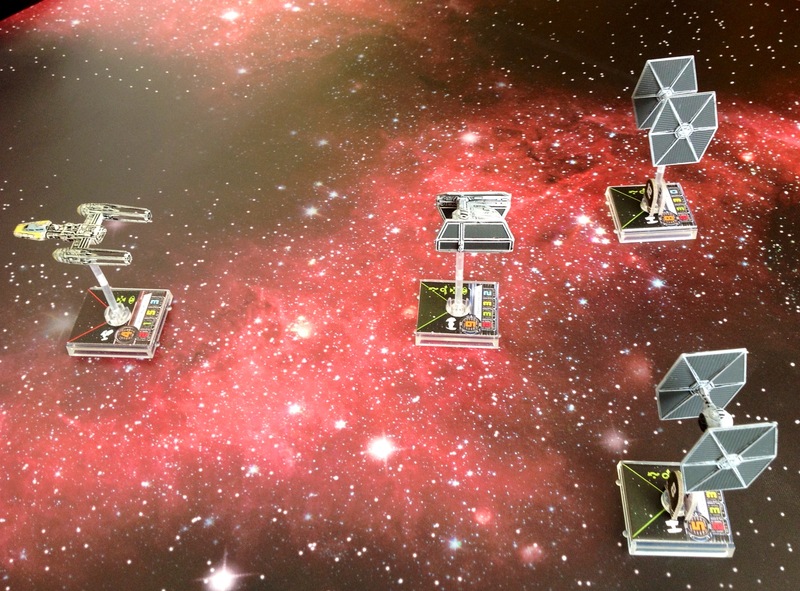 Though the starter set can be had on-line for around £25, it only gives you an X Wing and two Tie fighters. This is enough to try out the rules and see if you like them but to give a decent game you will want 3-6 ships per side, and at £12 per ship it soon gets expensive. I got mine for Christmas though, so I didn’t pay :-), but it is a consideration. That said, the possibilities for cliched Star Wars quotes during a game are endless, so the game gets a thumbs-up from me on that alone.